We are racing near Fountain Hills Arizona. The venue is placed within an old growth Saguaro Cactus forest. Many of the Cactus surrounding us at any point during the races are hundreds of years old. The weather is clear skies and a gentle breeze which helps keep riding comfortable. Races got underway with the Pro men at 12:15. The top ten were sent at 1 min intervals starting with last year’s Norba series winner JHK. It was a fast 6 mile (~10km) loop with lots of turns and undulating terrain. JHK (Sub –gary) held the lead the entire time with a smoking 19 min 44.1. Adam Craig (Giant) followed in 2nd at 9 secs back and Ross Schnell (Trek) Rounded out the top 3. 4th and 5th places went to the U23 riders Sam Schultz (Sub-Gary) and Sam Jurekovitch (USA). Sam S “The course was really fun…there was a limit to how fast you could go ...but it was really fun”. Matt Hadley was the only Canadian racing and finished in 23rd. Kabush, Talousse, Sneddon, McGrath, Plaxton, Legga, Evan Sherman and Tim Heemskerke will be racing this weekend,s cross country but opted out on the TT. The women followed the men and it was Luna’s Georgia Gould that claimed top spot with a very fast time of 22.47.5 followed by teammate Katrina Nash at 23.07. Jenna Zander (Bear Naked Cannondale) claimed her first norba podium position finishing 3rd edging out Kelli Emmet of Giant by 2 seconds. Mical Dyck (Trek) was the top Canadian in 8th with Melanie Mcquaid finishing 10th. Dyck was happy with her ride and glad to get a chance to ride the terrain at speed before the xc race. The tT overlapped sections of the xc course. Many of the top women also chose to skip the TT. Mary Mcconeloug is here and excited to race, Alison Sydor, Heather Irmiger, Koerber, Shonny..who finished just outside the top 10 in11th with a time of 24.35 will go up against other canadians Wendy Simms (Kona-les Gets), Pendrel and Sinclair. The Short Track starts tomorrow in downtown Fountain Hills at 7:30 with the women. It will be 20 min +3laps of a short ½ road/1/2 off road loop. There is a huge fountain that shoots Geyser like up from a lake that will be our starting point. Gould & nash and Kabush & JHK will be tomorrow’s favorites. Men go after the women at 8pm. Women have the xc course to themselves Sunday at 1:00. It is a fun, twisty 16.05 km loop with no significant climbing, just a lot of pedaling through undulating terrain. 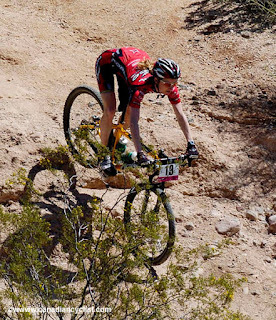 Heat and Cacti could be the determining factor in many riders races. Gould fresh off a Pan am Champ and TT win will be a favorite as will Mary Mac. The Men go at 3:30. Sunday is supposed to be the hottest day of the week. I’m sure JHK will be the fav. Great race, a little hot and not too much on the breaze dpt. Other than that GREAT race. hope to be in the next one.